Tidy up your patio, deck and yard in style with this gorgeous, all-weather Sumatra deck box by Keter. Because it’s made out of Keter plastic, a high-quality polypropylene resin, it is capable of withstanding just about anything without peeling, denting, rusting or otherwise becoming damaged. 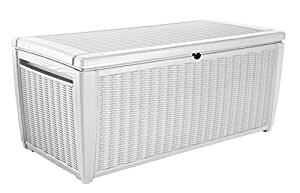 Its 135-gallon capacity makes it roomy enough to store everything from large patio furniture cushions to garden tools, pool supplies and more. As an added bonus, it is strong enough to support up to 770 pounds, so it doubles as an attractive outdoor bench as well. Get organized with a stylish plastic deck box. Tired of dealing with a cluttered yard, deck or patio? It’s all too easy for kids’ toys, garden tools, pool supplies and other odds and ends to get out of hand. What you need is a reliable, easy-to-use outdoor storage solution, and this elegant box by Keter should fill the bill nicely. You can store just about anything in it and feel confident that it will stay protected all the while. The box keeps stored items dry, and tiny holes keep them ventilated too. Therefore, you don’t have to worry about opening the box to musty odors or other unpleasant surprises. Safe, secure outdoor storage. All too often, all-weather storage boxes don’t include security features of any kinds. Luckily, that’s not the case with this attractive plastic box. It has a loop that can be used in conjunction with a padlock to securely lock up items when they aren’t in use. In addition to being lockable, this box has a hinged lid that features an auto-opening mechanism for convenience. Just start lifting the lid, and it will automatically open the rest of the way on its own. This box is UV- and weather-resistant, so there’s no need to store it away during the winter or to worry about it becoming faded in the hot, summer sunshine. â¢ Storage capacity: 135 Gal. â¢ Weight capacity: 770 lbs.